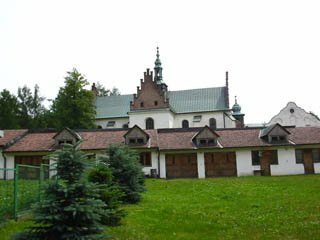 By the ancient route leading from Poland to Hungary, in the valley of the Stradomka river, in the shadows of the Ciecień and Grodzisko mountains, in the village of Szczyrzyc, almost 8 centuries ago the Cistercian Abbey was established. In times of Piasts dynasty Szczyrzyc was the seat of the county with the same name, but later on the county seat was transferred elsewhere and Szczyrzyc became famous of its cattle breeding and the agrarian culture. his was so because the Cistercians were the specialists in their agrarian and garden culture, following their motto ORA ET LABORA, pray and work, and by that they were an example to all their neighbors in all matters pertaining to garden and agriculture. The founder of the Abbey was Theodor, the palatine of Cracow bearing Griffin, as his coat of arms. 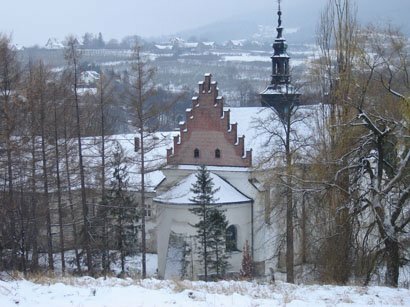 He invited monks from the Cistercian Abbey in Jędrzejów to come and to colonize his wild territories in all vicinities of Ludźmierz changing them into cultivated fields and to penetrate the hearts and minds of their inhabitants by teaching them the principles of the Christian doctrine and of love of the Blessed Mother. The future transfer of the seat of the Abbey from Ludźmierz to Szczyrzyc is immersed in the darkness of times. Some say that it was caused by the invasions of Tartars, some that it was done on an account of the constant attacks of the local thieves who molested the monastery hoping that their crimes will not meet any punishment. The seat of the Abbey was transferred, but not their expositure that is their Cistercian parish which once established was served by the Cistercian monks for many centuries to the local inhabitants of Ludźmierz and its large vicinity. Since the prime duty of the Cistercians was to cultivate the devotion to the Blessed Mother, they implanted it to the minds and hearts of the inhabitants of Ludźmierz and Szczyrzyc, where She was symbolized in Ludźmierz in the wooden statue, and in Szczyrzyc in the artistic picture of the Divine Lady considered as miraculous by the peoples of our country and by outsiders. 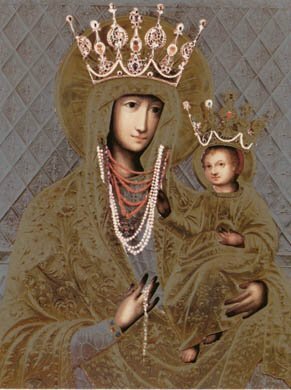 Pope John Paul II prayed in both these places and he himself crowned the statue of the Blessed Mother of Ludźmierz and blessed the golden crowns for Our Lady of Szczyrzyc, to be placed on the picture be Primate of Poland Card. Glemp, replacing the older crowns of Archbishop Card. Sapieha. Long time ago before, Abbot Romiszowski in 1727 ordered the execution of the royal vestments and crowns for both these Madonnas by the famous, at that time, goldsmiths in Cracow. 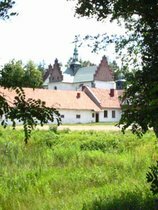 The history justly attributes to the Cistercians the foundation of the town of Nowy Targ and the construction of the small defense castle in Szaflary. They too are responsible for the transformation of the wilderness of the territories close to Tatra Mountains into cultivated fields, for the regulations of the rivers and to facilitate communication for the construction of bridges and finally for teaching the local youngsters the art of different crafts, especially those useful in agriculture and horticulture. Before art of printing was invented all liturgical books were hand copied by the industrious monks. Many times the copying monks illustrated their books with beautiful pictures and ornaments. 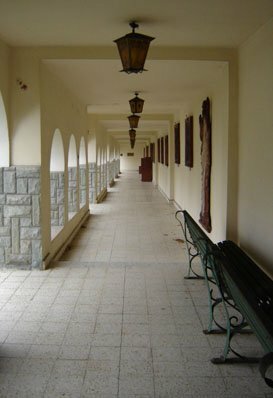 Their work was very tedious and many times was not understood especially by those who do not know how to read. In one of the manuscripts preserved in Szczyrzyc we have the answer. Scribere qui nescit, nullum putat laborem. Tres digiti scribunt at totum corpus laborat. It means: For the ignorant to write is not any work- three fingers are writing, but doing so the entire body is tired. During time of partition of Poland, the Cistercian suffered very much. Some of their monasteries were completely liquidated and the Cistercian from Szczyrzyc and Ludźmierz were deprived of their possessions and agriculture and the government forbade them to take in any new vocations. The Abbey was destined to die. But even than, when the terror was somewhat mitigated, the Cistercians following their old way of education established a small school for boys in Szczyrzyc, and one of their students was, now famous writer Władysław Orkan. During Hitlers occupation of Poland, regardless all the strictest prohibitions concerning teaching, the monastery in Szczyrzyc became a shelter for all refugees from different parts of Poland and the cells of monks became rooms for the secret teaching of the students and eventually in monastery a Private Cistercian Gymnasium was established. In 1955 the communistic government closed our school and in front of the ancient monastery a factory called "Meblomet" was built, to exclude influence, the monks could have over the Polish youth. In recognition of the extraordinary bravery during war the Cistercians of Szczyrzyc were awarded with the cross VIRTUTI MILITARI. Now in Poland liberated by Solidarity from the totalitarian communism the Cistercians redeemed some of their possessions in land and forests in order to keep up their agrarian traditions. Following some annals reaching year 1623 the Cistercian of Szczyrzyc used to make some beverage out of roasted barley, hop and chicory with addition of some sugar to relieve their thirst. The beverage was called CEREVISIA. This was a substitute for todays cafe or tee. In our times such a beverage is a light beer produced according to the old prescriptions as a malt beverage used in all cultural countries of the West.